Today, the 21st September, on the outskirts of Nablus at Qusin village, a demonstration against their roadblock took place. The roadblock makes a simple five minute journey to Sarra a minimum one hour ordeal through Beit Eva checkpoint. Similarly the barrier blocks travel from Qusin to Nablus. This forces residents, workers, students through a unnecessarily more arduous journey. 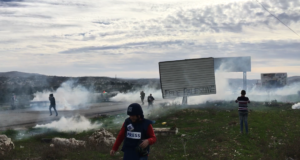 Despite last week’s violent outcome by part of the IOF where the demonstration ended in mass arrests, approximately 75 local Palestinians joined by a dozen ISM activists marched peacefully through the roadblock. Additionally 5 members of the Bil’in committee joined the demonstration to show their support. Unfortunately a large number of Israeli activists were followed by the IOF, police, and Shabbat; thus preventing them from attending the peaceful demonstration. The march started at 1 pm with the participants waving flags and chanting in good humor. The demonstration crossed the roadblock in the absence of any incident due possibly to the imminent Jewish festivity of Yom Kippur and the gate already having been smashed at last week’s demonstration. Once the march reached Sarra, symbolically joining the two villages, the participants headed back towards Qusin. 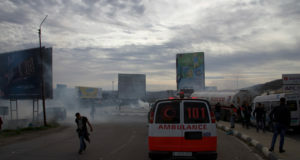 Throughout the march’s return an IOF jeep followed the procession attempting to provoke rock-throwing from the large number of youth attending the demonstration. In the proximity of the village the jeep was reinforced by two military vehicles. Their aggressive stance reached the extent of driving at an ISM activist. The IOF then speeded through the village once again attempting to provoke rock-throwing from the children. Nevertheless the children restrained themselves; therefore making the demonstration as a whole truly nonviolent. At the end of the march the mayor of Qusin invited the ISM activists to the municipal hall and truly thanked them for their strong presence throughout the demonstration. The positive outcome of the march has encouraged the villagers of Qusin to pursue a continuous nonviolent campaign to remove the infamous roadblock. 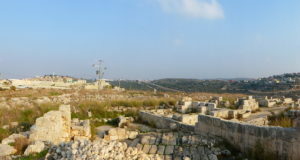 Later that day at around 5:30 pm, once the ISM activists had left the village, the IOF invaded the village of Qusin. The IOF went to the municipality and threatened to arrest every man of the village between 18 to 40 years old unless two under 18 youths were handed over. Even after apprehending the two youths, the IOF returned to the village using live ammunition. On this occasion the IOF directly arrested three more youths at around 9:30 pm. Still today 22nd September 2:30 pm they haven’t been released or been charged.